In a typically varied programme, the Research Café held at the Aldham Robarts Library on 27th March covered topics ranging from energy efficiency to animal behaviour. Obrad Dordevic, a PhD student in Engineering, Technology and Maritime Operations, gave a brief history of high-voltage electricity transmission systems (“The Grid”) and the differences between the US and Europe, where different compromises have been made to optimise frequency and voltage. The three-phase system has been found to be optimal for generation and motoring, using a rotating field to increase the speed of motors. Multiphase systems can deliver benefits such as savings on electricity, increased fault tolerance and torque enhancement. Obrad’s research combines multiphase and multilevel topologies to utilise the best characteristics of each. His results, using a 5-phase machine, have shown that a simple system can deliver the same results as a complex one and that the grid can go beyond 3 phases and be set to fit the machine, delivering multiple benefits. The next speaker, Claudia Mettke-Hofmann from the School of Natural Sciences and Psychology, is a lecturer in animal behaviour. Her PhD research examined information-gathering in animals – how they assess their environment and decide where to forage etc. In theory, animals should adapt to the costs/benefits of collecting information: for example a species living in a very variable environment would benefit from more extensive information-gathering than a species living in a stable environment. Claudia investigated 61 parrot species both in the wild and in captivity and looked at the extent of exploration and neophobia in the different species. Her research showed that ecological conditions did have an effect on how the different species assessed their environment. Species from complex habitats demonstrated very short exploration times whereas island species were very explorative. A possible additional future area of research is how animal behaviour is influenced by social conditions. Fazlli Patkar is from the same research group as Obrad and his presentation covered a different area of energy research. Fazlli is researching the control of electric vehicle motors, looking at how these can be made more efficient. The typical electric drive configuration is a single-sided 3-phase supply. An alternative dual converter configuration can utilise a higher voltage, provide better fault tolerance and deliver greater efficiency. Fazlli’s PhD work is on the development of control strategies for dual converter, multiphase drive configurations. His experimental set-up has shown that a multiphase motor and dual converter can deliver the benefits of both topologies and that the prospects for potential utilisation of this type of configuration are very good. 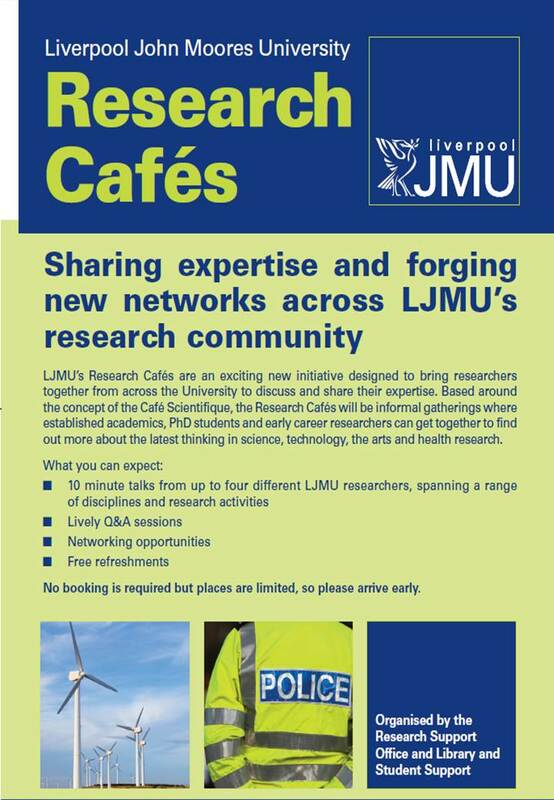 This month only three speakers were able to attend the Research Café but once again it was very interesting to find out more about the range of research being carried out at LJMU. The next event will take place at IM Marsh on Wednesday 24th April and the programme is available here. This entry was posted in Engineering Technology and Maritime Operations, Natural Sciences and Psychology and tagged research by ljmulibrary. Bookmark the permalink.